I’ve been so sick for a couple of weeks, that I haven’t felt like cooking much at all. After getting sick of eating nothing much but breakfast cereal and toast, I really needed to make something that was easy, that I could make a large batch of, and reheat as needed. And with a cold and a sore throat, soup ticked all the boxes and has been just the thing I’ve needed. This soup is pretty easy to make, which is good since I’ve felt so awful. 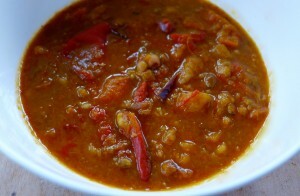 It is a substantial and yummy blend of grains, lentils and beans cooked in a tomato and stock base, with extra vegetables added near the end. The secret ingredient is roasted pumpkin (I just happened to have some in the fridge) which I added to the soup near the end, along with the extra vegetables. While they are cooking the pumpkin melts away to a smooth background, thickening and enhancing the soup’s flavour and texture. It is a meal in a bowl. Put the lentils beans and barley into a large pot with the stock and tomatoes and bring to the boil and reduce to a simmer and cook until soft. Add the vegetables and roasted pumpkin and cook until the vegetables are tender and the pumpkin falls apart. Where can the soup packet be purchased? Can one get it online? i am interested in trying it..
Hi Kathryn I am not sure where you are. I am in Australia and we can buy soup mix of different lentils, peas, beans and barley in any supermarket. If you can’t get the mix, you can make up your own. There’s no “right” ratio. I use a couple of different kinds and they differ quite a lot. This soup looks so warm and comforting. I’m sure it helped make you feel better and I hope you fully recover soon.